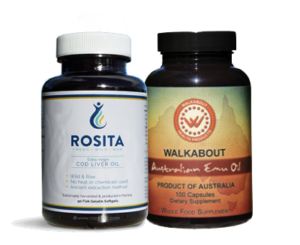 Rosita CLO gelcaps and Walkabout Emu Oil caps provide essential fats and vitamins. 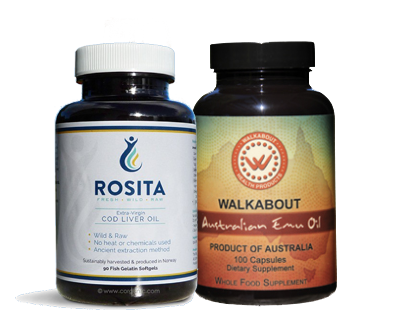 Rosita Cod caps have EPA-DHA with natural sources of Vitamins A and D. Walkabout Emu Oil is a rare food source of the MK-4 form Vitamin K2, anti-inflammatory fats, Omega 3’s and other life-sustaining nutrients. 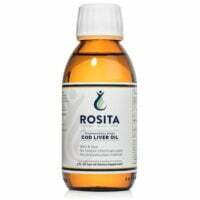 Rosita Cod Oil is harvested in Norway from true Atlantic cod right out of the water. It contains more DHA than EPA, an important ratio only cold water Atlantic cod can provide (and other cod do not). Read more about this superior oil here and here. Walkabout Emu Oil is from a unique non-hybridized species of Emu different from Emu oil used in cosmetics. Go here to read more about Emu Oil. It contains 10 to 20 times more K2 than high vitamin butter oil. 3 capsules provides 1/3 tsp. Cod Oil. Store at room temperature; do not refrigerate. Take with food with fat. Always take Vitamin D (such as Cod Oil contains) WITH Vitamin K2 such as our Emu Oil or BioCeuticals K2. There is an inadequate amount of K2 in High Vitamin Butter oil. Extra D3 may be helpful too. Contains 90 Rosita CLO caps (500 mg each). 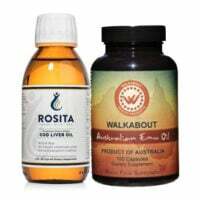 Walkabout Emu Oil contains the rare MK-4 food form of K2. 4 caps provide 3.6 mcg. Vitamin K2. Much more than pastured butter or butter oil extract. MK-4 is different from processed MK-7 and lower doses are required. 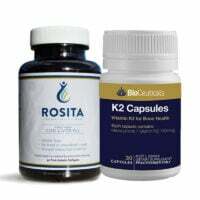 Adults: 2 – 3 caps daily long-term, or 6/day to first replete Vitamin K2 and Omega fats. K2 manages calcium in the body. It can remove calcium from the arteries and place it where it needs to go into bones, teeth, nerves and muscles. Children: 1 – 2 cap daily long-term for K2 and Omega fats. The capsule may be opened and contents added to food.